The volatile content acquired upon formation crucially influences the long-term fate of rocky planets. New numerical models suggest a systematic offset in their accreted water budgets, depending on the planetary system’s primordial enrichment of Aluminium-26. Water seems to be abundant on Earth and covers more than two thirds of the surface of our world. But in astronomical terms the inner terrestrial planets appear very dry. Compared to the relative fraction in the solar system’s gas and ice giants, they lack their ‘fair share’ of volatiles compared to the Sun. Aside from the absence of land, acquired water mass fractions over about 1% generate high-pressure ice phases at the interface between the global ocean and the silicate mantle for terrestrial planets located in the liquid water zone around M or G dwarf stars like the Sun. Such icy carapaces lengthen, or completely inhibit, geochemical cycles, with negative outlook for the planets’ long-term climate stability. So it seems we were just extraordinarily lucky in the distant past. Were we? Or are there systematic effects at play that distinguish solar system-like planetary systems from others? A likely important contributor of water to inner planetary systems is delivery from water ice-rich planetesimals, the initial seeds of the planet formation process. Typically, volatile abundances of these planetary building blocks are scaled from observed meteoritic abundances. However, we have samples of thermally processed 'achondritic' meteorites and iron meteorites, and can trace the abundance of radioactive decay products in chondrites, the most pristine witnesses of the early solar system of which we know. All of these suggest that planetesimals that formed during the protoplanetary disk stage were substantially heated from the radioactive decay of 26Al, a short-lived radionuclide with a half-life time of ≈ 0.72 million years. This conventional wisdom from the meteoritics community made us curious: if you imagine a primitive rock–ice assemblage being heated from within, then surely some of the volatile content would be lost. If substantial, would that loss influence the final bulk water abundance? 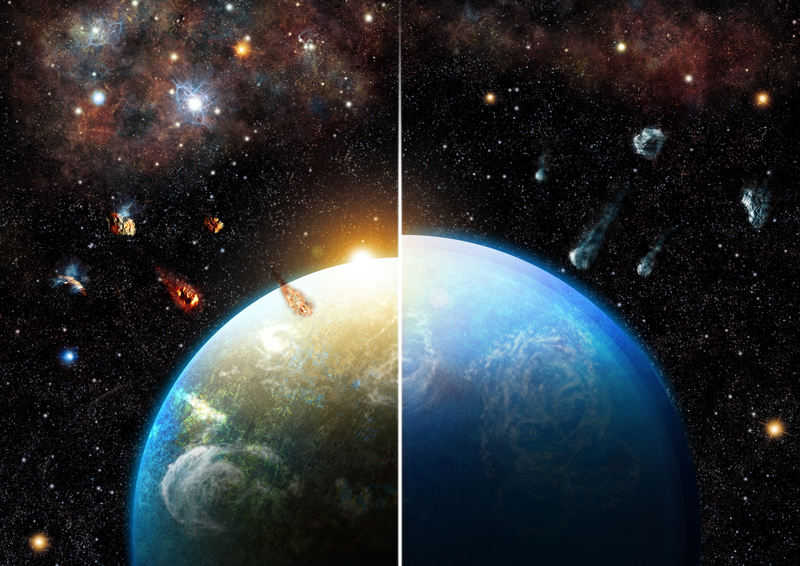 The impact on the potential ‘habitability’ of forming planets could be profound. We know that 26Al was present in the early solar system, but would this 26Al-induced desiccation be a generic mechanism or rather create systematic diversity across planetary systems? The main contribution of the 26Al inventory in the galaxy comes from massive stars, and is externally injected into nearby planetary systems in the early phases of star and planet formation. Because of the local dependence on the presence of a supernova progenitor, and the morphology and dynamics of the birth star-forming environment, pollution of planetary systems with 26Al may follow a bimodal distribution: either enrichment similar to (or greater than) the solar system or none at all. Initial differences in 26Al abundance by orders of magnitudes across planetary systems have consequences for the radiogenic heating particularly during the early phases of planet formation. As our models now demonstrate, the radiogenic heating of solar-like or higher 26Al levels in a forming planetary system dehydrates planetesimals prior to accretion onto planetary embryos. The detailed compositional consequences depend on the accretionary phase space, such as the onset and timing of accretion, and the size and original composition of accreted planetesimals. However, since 26Al desiccation proceeds on a timescale faster than planet accretion, the degree of water-depletion is generically correlated with the initial abundances of 26Al at the time of planetesimal formation. These findings may provide another piece of the puzzle to place the solar system in the context of exoplanetary systems. Our models reveal that rocky planets formed in planetary systems with high 26Al abundances are expected to be systematically smaller in radius than those in systems without it. This may be detectable with future transit missions like PLATO. Such inferences can pave the way toward a greater understanding of the distribution of Earth-like planets. Our work illustrates that the internal geophysical evolution of the seeds and building blocks of planets may alter their final structure and composition. The heat engine of planetesimals will vary across young planetary systems due to the enrichment and interactions in the birth star-forming environment. In this way, the composition of rocky planets can be linked to their origin during star formation. Further consequences of these inferences need to be explored. How does a forming giant planet, blocking the radial flux of icy bodies, play together with 26Al desiccation to alter the local water budget in the terrestrial planet zone? What are the consequences of successive episodes of planetesimal formation? And do varying accretion scenarios of rocky planets alter the early surface and climatic conditions for similar compositional budgets? These and further questions remain to be answered if we wish to understand the defining parameters of our world relative to the rich diversity already detected among the extrasolar planetary census. The research article published in Nature Astronomy Letters can be found here.